File Name: Edwin C. Steen of Seattle, Washington. Notes: Seattle, on Puget Sound, is Washington's largest city and one of the top medical research institutions in the US. It is also the hometown of Rapid-Fire and is listed as Ace's birthplace on his 1992 filecard. 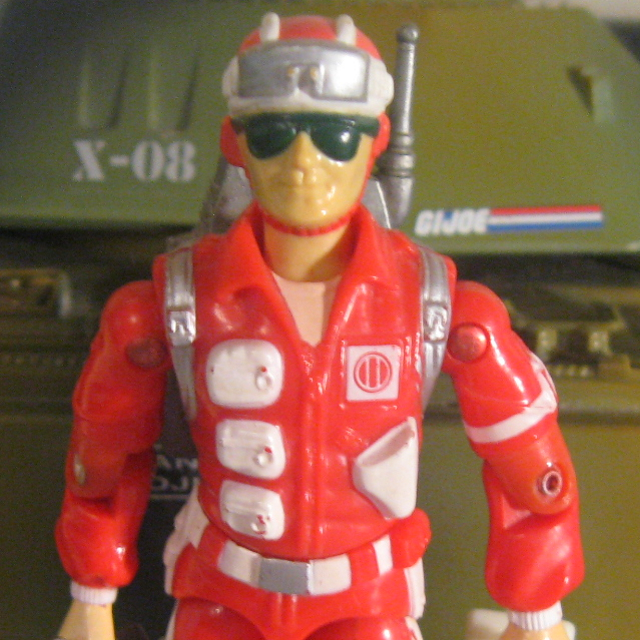 Sunbow's Lifeline wore his 1986 outfit with no chest holster or leg knife. In the series he was a pacifist and the son of a minister (Episcopalian by appearances, though possibly Methodist). He was called by his given name Edwin in the episode Second-Hand Emotions. G.I. Joe: The Movie, Part 4 6 seconds (silent) hiding B.E.T. Accessories: silver flat semi-automatic pistol with smooth grip (new), black air mask with long air hose (new), silver communications backpack with thin antenna (new), white hinged case with red RESCUE lettering and hole for air tube (new). Lifeline was a para-medic with the Seattle Fire Department for five years before he discovered that EMS (Emergency Medical Service) personnel who were disabled while giving aid off-duty were not eligible for pensions. In his mind, rescue personnel were never off-duty. He decided to make his status permanent by enlisting in the army as a corpsman. "Elite units always take care of their own. The Joes are no exception. The troops have to know that if something really heavy comes down on them and they're in no condition to walk out of the mess, somebody is going to have the heart to wade in and extricate them. That somebody is Lifeline." Accessories: black pistol (86 Lifeline's), black air mask (86 Lifeline's), black backpack (86 Lifeline's), light green rescue case (86 Lifeline's). LIFELINE was a paramedic with the Seattle Fire Department for five years before he discovered that EMS (Emergency Medical Service) personnel who were disabled while giving aid off-duty were not eligible for pensions. In his mind, rescue personnel were never off-duty. His status was made permanent when he was selected by Tiger Force as a battlefield medic. "Elite units always take care of their own. Tiger Force is no exception. The men have to know that if something really heavy comes down on them and they're in no condition to walk out of the mess, somebody is going to have the heart to wade in and extricate them. That somebody is Lifeline." Accessories: silver backpack (86 Lifeline's), white rescue case with red lettering (86 Lifeline's). Toy Notes: Available via an offer from Rice Krispies cereal; the offer also included figures from the My Little Pony and Weebles lines. The original legs were replaced to remove any appearance of weapons on the figure, and the "RESCUE" font was slightly different. This version is not significantly more valuable than the store version. Accessories: yellow flare gun (90 Stretcher's), black arm-mounted spring missile launcher with loop next to red trigger (new), thick yellow spring grappling hook missile (new), yellow knife (88 Hit & Run's), yellow case (90 Salvo's), yellow searchlight (86 Wet-Suit's), yellow figure stand (common). LIFELINE was a paramedic before enlisting in the Army as a corpsman. Because of his rescue talent and experience in emergency situations, he joined G.I. Joe to aid soldiers wounded during firefights with Cobra. To get to the injured, Lifeline often has to fight his way to their location, which is why he carries a grenade pistol along with his extensive assortment of medical supplies. Most EMS (Emergency Medical Service) personnel treat patients behind the lines, Lifeline treats them ON the lines because every second counts when it comes to saving lives! "When I'm working in combat zones with bullets ripping past my ears, I know I'll either save a wounded soldier, or become one!" Variations: First sold on 1993-style packaging with a normal-sized filecard, then on 1994-style packaging with a baseball card-sized filecard with abbreviated text. Toy Notes: Item #81007. Note that this version of Lifeline is not a pacifist.